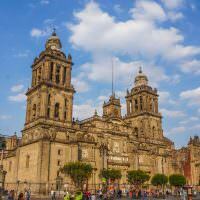 Mexico City is possibly one of the world’s most underrated foodie destinations. From street side stalls churning out tacos and tamales, to world-class restaurants serving up thousand year-old dishes with a modern twist, this chaotic capital is a food-lover’s paradise. 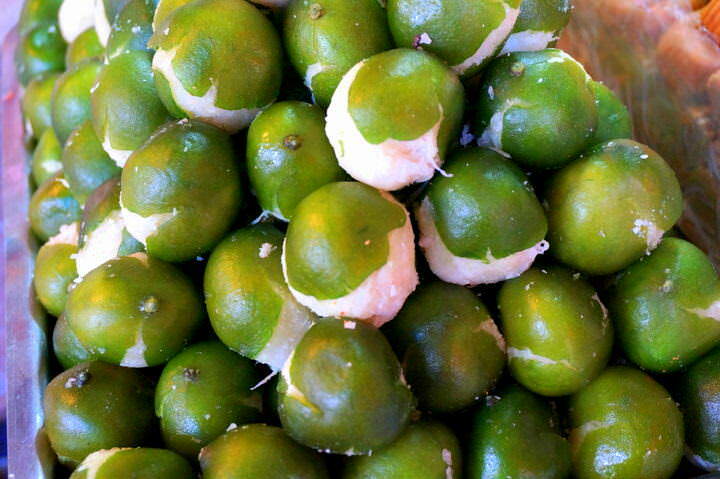 Mexico is a nation deeply rooted in gastronomy. The cuisine consists primarily of a fusion of indigenous Mesoamerican cooking techniques and European (particularly Spanish) influence that has permeated the food culture here since their conquest of the Aztec empire during the 16th century. Coming to the capital city of one of the world’s culinary giants, we knew that we wanted to experience a food tour that would teach us a little bit more about this incredible cuisine, and when we found Eat Mexico’s La Merced Market Tour, we knew that it was the perfect excursion to satisfy the intrepid travellers inside of us. 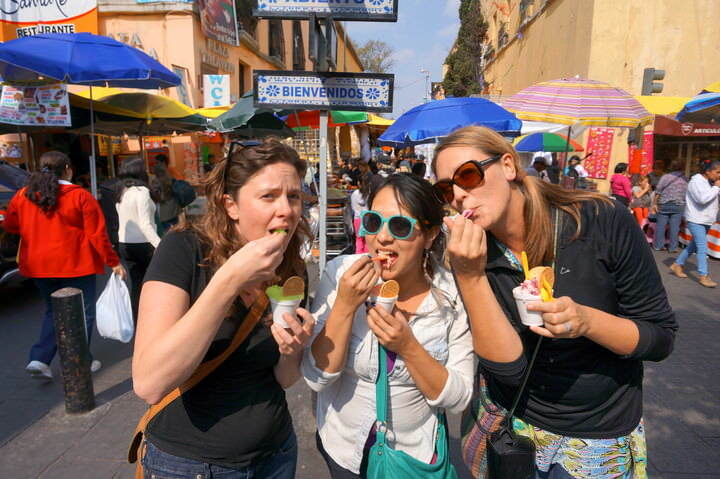 We met Anais, our guide, and Lydia, Eat Mexico’s manager, outside of the stunning Palicio De Bellas Artes (Palace of Fine Arts), which was just a short walk from the Amigo Suites Hostel where we were staying. They gave us a quick rundown of what to expect on the tour and before we knew it we were off, descending down into the frenzied subterranean bloodline of Mexico City… the subway. From the moment we entered the underground metro system, it felt as though we were being pumped through the veins with the frenetic pulse of this enormous mega city. We got off the train and ascended the stairs to enter one of the city’s largest markets, La Merced. This is the primary wholesale market and its hectic aisles were alive with local grocers and shoppers hunting for the best bargains on bulk food. Lydia warned us that we should stick together because things can get a little hectic in the center of the market. Dariece and I tried to keep close, but we were constantly distracted by the sights, sounds and smells that surrounded us. Mexican skillets, comals and cazo pans sizzled and popped as we walked by, each one wafting the familiar aroma of chilie, lime and grilled meat towards us. In the most congested corners of the market, we were shoulder to shoulder with the Mexican people, who were rushing to purchase, pack, sell or stock their goods. Women squeezed by us wearing traditional dress, carrying loads of groceries on their heads, while short, stocky men hollered at us to move out of the way as they wheeled by with heavy dollies full of produce. In the thick of the action, the air was hot and sticky with the body heat of countless people, and the steam from chaotic kitchens which were churning out meals for their hungry customers like well-oiled machines. We followed Lydia and Anais like obedient sheep, completely lost in the chaos. We frequently stopped in the midst of the madness to taste some of the incredible food on offer. We ate everything from grasshoppers to gorditas, and each dish was delicious (well, the grasshoppers were a bit harder to get used to). We stopped at a pre-hispanic food stand where a traditionally clad woman proudly described each of her exotic ingredients to us in Spanish. Anais translated and we were surprised by what we heard. 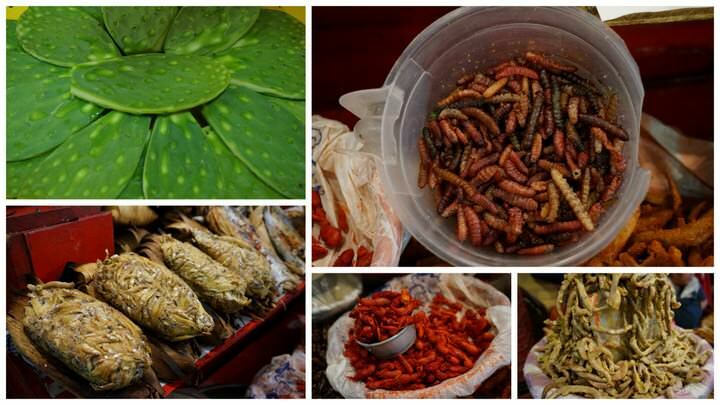 The woman’s colorful table included delicacies like pond flies, frogs, crickets, crayfish and agave worms. Not items that you’d typically find in your mother’s cupboard, but each ingredient packed a distinct punch and all had a place in many traditional Mesoamerican dishes. We also walked through what Anais called “The Hallway of Terror” where every animal carcass you can imagine was strung up, hooked and dissected for everyone to see. The smell of raw flesh and blood was palpable and we were reminded that seeing goat stomach and cow testicles is not something we’ve gotten used to, even though we’ve visited dozens of markets like this one. We were able to sample anything we wanted while we navigated our way through the maze of fruit venders, taco stands, butcheries and candy stores. If something caught our eye, Anais would order it up before we could decide if it was something we even wanted to taste. There was literally no limit to the samplings on offer. We were happy that she had her main stands to take us to, but also loved that we were able to pick out our own snacks wherever we went. The tour took our palate on a rollercoaster ride of sweet, salty, savoury and sour. Nothing tasted bland and everything provided a different experience for our tastebuds. Most of the dishes we tried were things that we had never seen in 4 months of travelling around Mexico. The candy section was, of course, one of our favourites and the coconut stuffed candied lime is our new go-to Mexican desert. The normally tart skin of the green fruit was made sweet by the liquid sugar-coating and the sticky shaved coconut stuffing. Everything we tasted on this food tour was delicious. There were some more common snacks like tacos and huaraches, mixed in with some stranger Mexican cuisine like grasshoppers and fermented pineapple juice. Anais explained each ingredient in detail, breaking down the ancient recipes and teaching us about the unique cooking techniques. After four hours of walking around La Merced and the surrounding neighbourhood, our senses were numbed, but we were finally able to relax in a lovely restored mansion where we enjoyed a cold beer and yet another traditional snack of salty cream cheese topped with… you guessed it… grasshoppers. 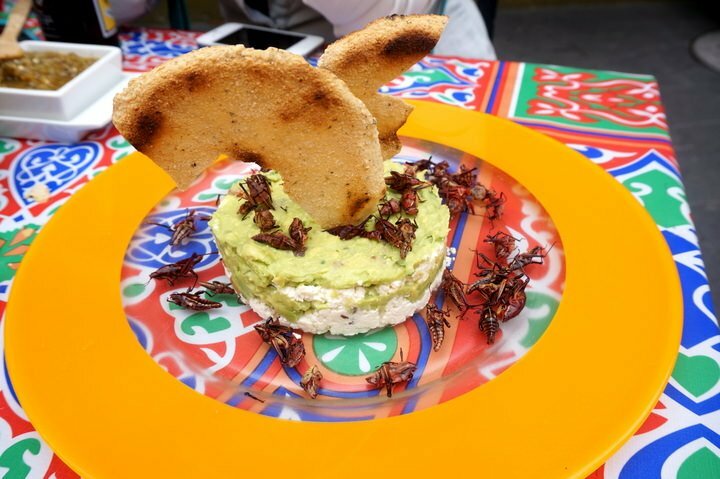 Grasshoppers & Cream Cheese… An Appetizer You May Not Find At Home. The Market Tour was fantastic and we left with a new appreciation and knowledge of Mexican cuisine. 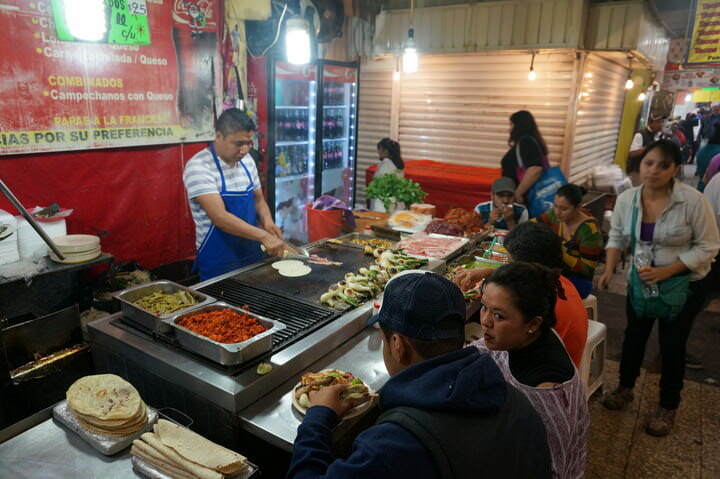 Eat Mexico has many different culinary expeditions to choose from and while the Merced Market may be overwhelming for some, there are easier, more gringo friendly tours on offer, including Anais’s favourite, the Late Night Tacos & Mezcal Tour. As always, we’ll try to give some pros and cons for the Merced Market Tour to help you better decide if it is right for you. Our experience was excellent and we will definitely be recommending this tour to any food-lovers planning to visit Mexico City. The beer was the perfect finish to an exciting day! We weren’t taken back to our area of the city at the end of the tour, but Lydia & Anais did give us good directions to get home. For more about each individual dish that we tried on this tour, don’t miss the video below! 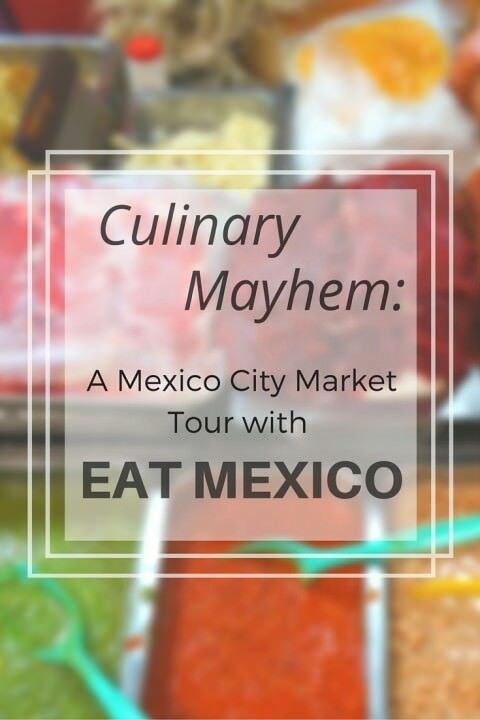 A Special Thanks To: Eat Mexico for hosting us on this amazing market tour. As always, all thoughts and opinions remain our own, despite any complimentary services offered. Check out their website for more about their excellent food tours. Wow! I definitely missed out on a lot of interesting food when I visited DF! Those grasshoppers and cream cheese look especially interesting! It was definitely interesting! Actually, they didn’t taste too bad 🙂 Really liked the cream cheese and avocado on top too! The food in Mex DF was great! Sounds like a fascinating culinary round-up; I would like to pick up some of the vegetarian options out there! The food in Mexico is incredible, and there are lots of vegetarian options as well. This tour was epic and we were so full! Enjoyed all of the food and the company as well. Wow! I can’t believe that Mexico city also has a traditional market like that. It looks like some night market in Thailand :)). I hope one day I have a chance to visit and enjoy cuisine in this destination! Thanks for sharing and cheer!